To put on 3-D glasses, as cumbersome a visual aid now as they were in the '50s, is already to surrender to cheesiness. 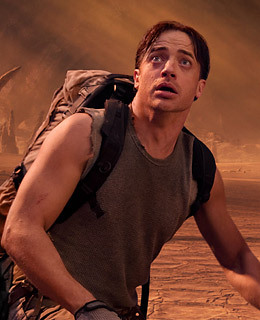 This loose take on Jules Verne's novel, with Brendan Fraser as the wayward scientist, is the ideal vehicle for stuff jumping out at you: yo-yos, waterspouts, antennae, dinosaur drool, the works. It's fun for tweens, a sedative for their parents.